Samsung has added a feature to its latest QLED televisions that allows the screen to appear almost transparent when not in use. 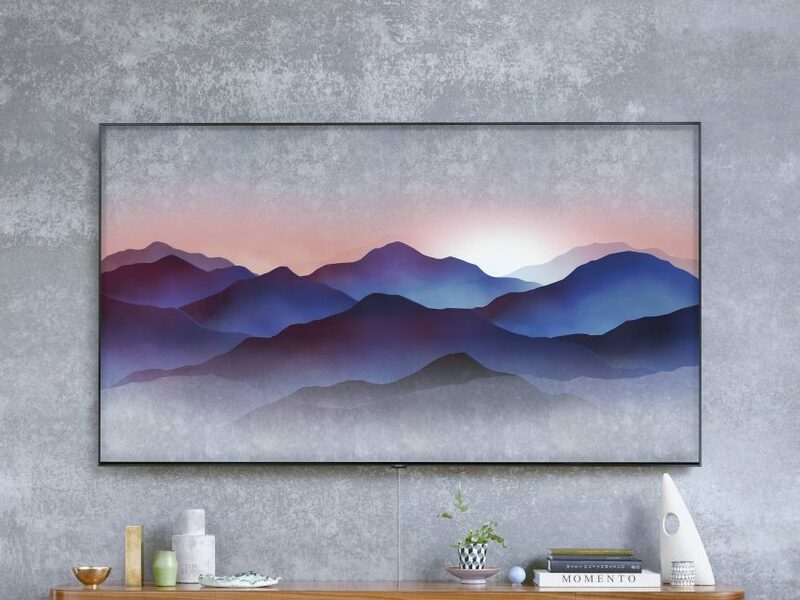 Samsung’s Ambient Mode is designed to cloak the television by mimicking the look of the wall behind it or to enhance the environment with additional imagery and information, such as the time, weather or news headlines. The function is built into the tech giant’s 2018 QLED televisions. These sport an ultra-thin bezel and Samsung’s signature One Invisible Cable, which means that with Ambient Mode on, a wall-mounted television will blend almost seamlessly into the wall behind it. “TVs are turned on for only five hours a day on average, yet they occupy a large space on the wall in the living room,” said Samsung. Ambient Mode eliminates this black screen. The mode is set through an accompanying mobile app called SmartThings. A user takes a photo of the TV on the wall through the app, and the television analyses the wall’s pattern and texture to generate an image that fills in the gap. Optional information and images can then be overlaid, along with music. One of the more decorative options is a clock represented by silver balls inside a circle. The balls roll around to represent the hour, minute and second, and are scattered every hour on the hour, with accompanying sound effects. An alternative brings nature inside the home with a vista of mountain peaks. These change colour according to the time of day and brightness in the room — which is read via a sensor hidden on the front of TV — while birdsong and other outdoor sounds play. When it is raining in real life, the sound of raindrops play as they appear on the screen. Similarly, if it is cloudy, the scene will darken. Other options for the display include personal photographs or live data such as the weather, outdoor temperature and major headlines. In the dark or when no users are nearby, Ambient Mode automatically turns off to prevent unnecessary power consumption. The feature is the latest in a string of lifestyle-minded innovations from Samsung, following on from 2017’s artwork-like Frame TV by Yves Béhar and 2015’s more sculptural Serif TV by the Bouroullec brothers. Yoojin Choi, a UX designer at Samsung Electronics, said that Ambient Mode would create a hub for people to socialise around in the home.